ELA.RF.2.3d: Decode words with common prefixes and suffixes. ELA.RF.2.3e: Identify words with inconsistent but common spelling-sound correspondences. ELA.RF.2.3a: Distinguish long and short vowels when reading regularly spelled one-syllable words. ELA.L.2.2e: Consult reference materials, including beginning dictionaries, as needed to check and correct spellings. ELA.L.2.4c: Use a known root word as a clue to the meaning of an unknown word with the same root (e.g., addition, additional). ELA.L.2.4e: Use glossaries and beginning dictionaries, both print and digital, to determine or clarify the meaning of words and phrases. ELA.L.2.4a: Use sentence-level context as a clue to the meaning of a word or phrase. 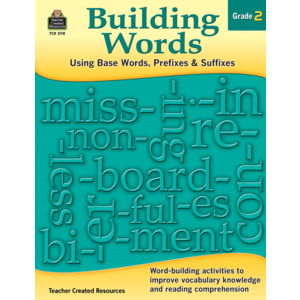 ELA.L.2.4d: Use knowledge of the meaning of individual words to predict the meaning of compound words (e.g., birdhouse, lighthouse, housefly; bookshelf, notebook, bookmark). ELA.L.2.4b: Determine the meaning of the new word formed when a known prefix is added to a known word (e.g., happy/unhappy, tell/retell). ELA.L.2.5a: Identify real-life connections between words and their use (e.g., describe foods that are spicy or juicy).